Update pegs project completion in Fall 2019 with finalized route. The UNO Station is shown here outside of the Eppley Administration Building. The project is planned for completion in fall of 2019. 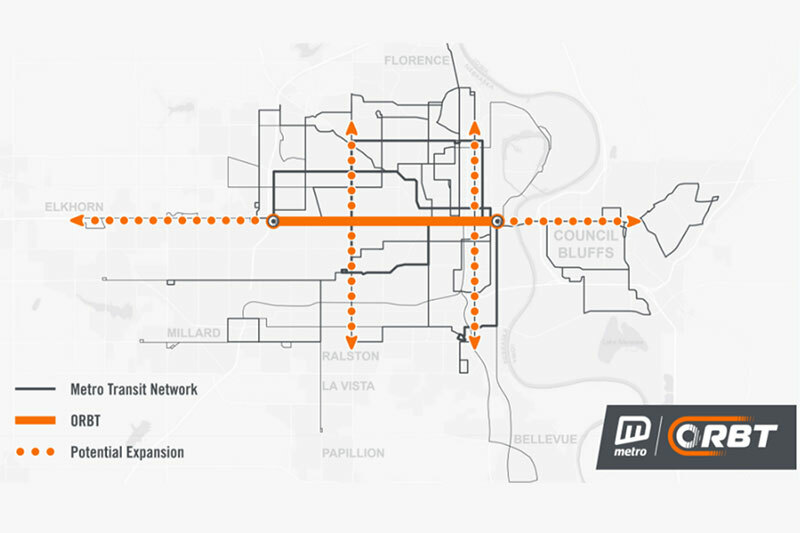 Potential future ORBT routes running north and south connecting other areas of Omaha are shown here. The first route will run along Dodge Street and will have a stop at UNO. Westroad Transit Center's changes are depicted here. This would be the most western access of ORBT with connections to other Metro buses. 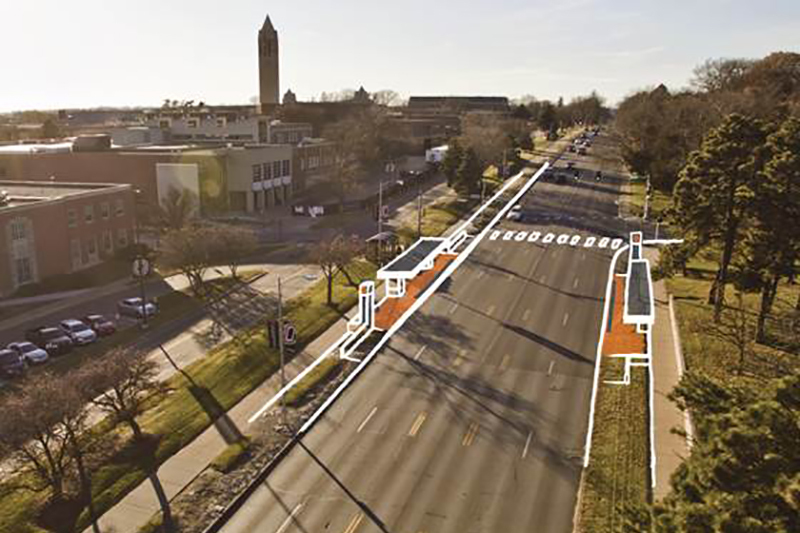 Dedicated bus lanes for ORBT downtown are depicted here. The route will run to 10th Street. Omaha is following the lead of cities worldwide that use bus rapid transit to move thousands of people everyday. On Thursday, May 10, Metro hosted a press conference to announce updates to the project. 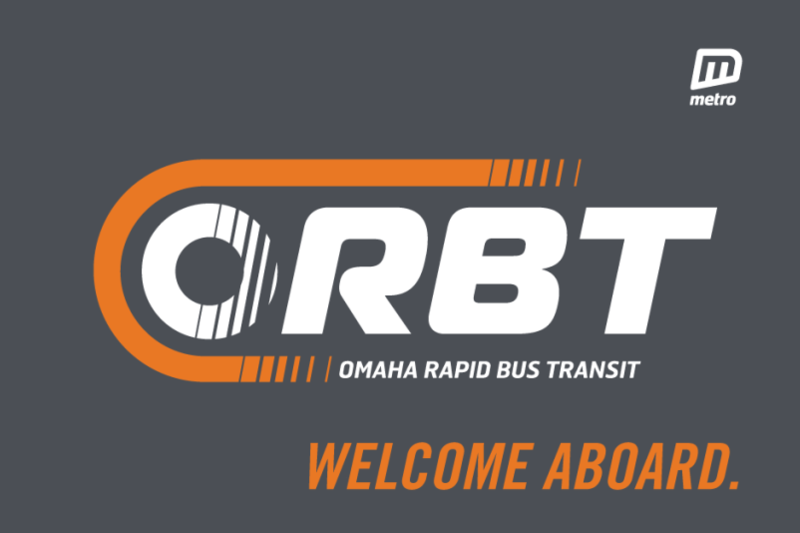 ORBT will begin at the Westroads Mall station and run to downtown Omaha. One of the route stops will be located on UNO's Dodge campus just outside of the Eppley Administration Building. This will allow a fast and efficient way for the UNO community to travel downtown without the hassle of finding and paying for parking. The route is expected to launch in Fall of 2019. More frequent access to downtown, Westroads Mall and other stops in between for faculty, staff and students. UNO will have a stop at the midpoint of the route outside Eppley Administration Building offering terrific access to the city. Wifi will be available on the buses along with GPS tracking and real-time scheduling at the UNO Station. The 60-foot, compressed natural gas (CNG) powered vehicles will serve stations every 10 minutes during rush hour. Metro and UNO are still discussing payment options. Currently, thanks to MavRide, trips on Metro are free with swipe of your MavCard. December 2013: Regional Transit Vision recommends Bus Rapid Transit (BRT) as priority project. September 2014: Metro is awarded a Federal TIGER grant for $14.9 million. August 2015 - June 2016: Public input influences design of stations, vehicle amenities and brand. Octoer 2015: A stakeholder committee begins to meet regularly to inform the BRT project. (Jason Buzzell is UNO's representative). 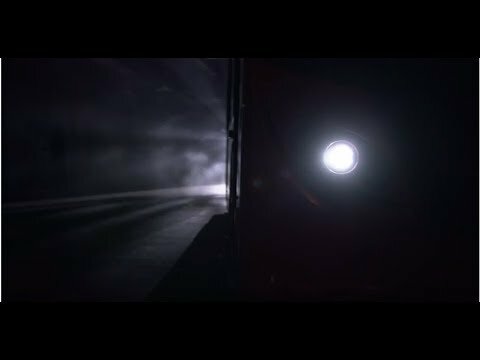 August 2017: Metro announces ORBT Brand. Fall 2018: Final design work completed and construction begins. Fall 2019: ORBT begins operation. For more information, visit the Ride ORBT website. 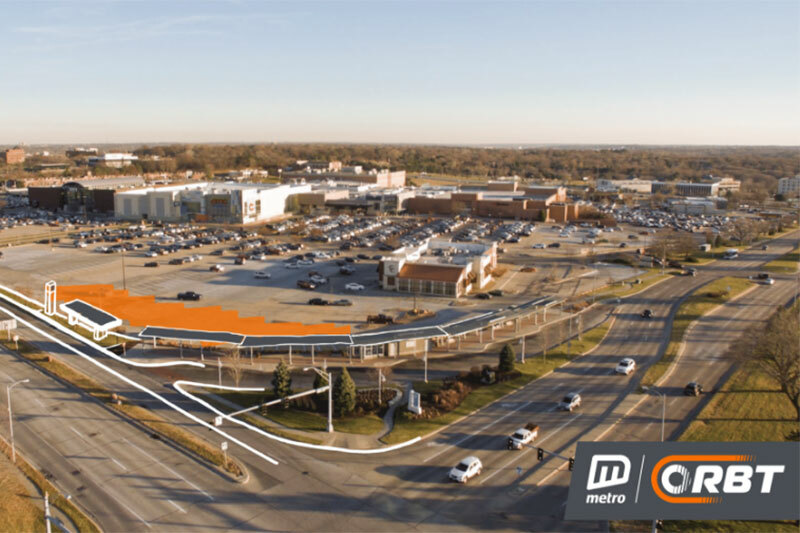 Omaha Metro announced the new brand of their Bus Rapid Transit project on Wednesday, Aug. 16 at a press conference in Westroads Mall. The project breaks ground in late 2017 with ORBT operations beginning in late 2018. The visioning of the project began in December 2013 with a Stakeholder Committee established in October 2015. A variety of public engagement sessions, including two at UNO's Thompson Center and Durham Science Center have taken place to date. 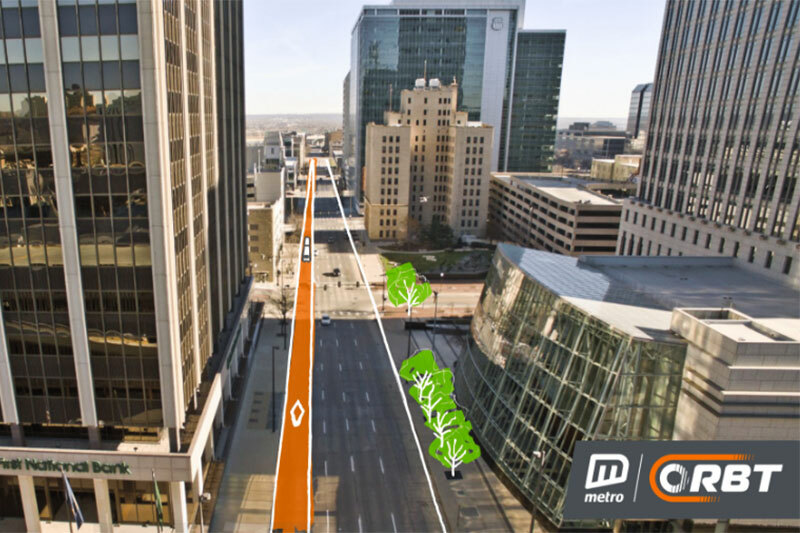 The route will begin and end at Westroads Mall and Downtown Omaha, running through UNO down Dodge Street. On August 13, 2015, Metro held a public open house to provide an update on the BRT project and to reveal three preliminary station design concepts. On June 15, 2016, an additional public open house showcased modified station designs and sought feedback for vehicle amenities. Throughout the project, Metro took suggestions for brand names and values, all of which informed the final name. ORBT was a local suggestion, and the brand features were inspired by values offered by the public.